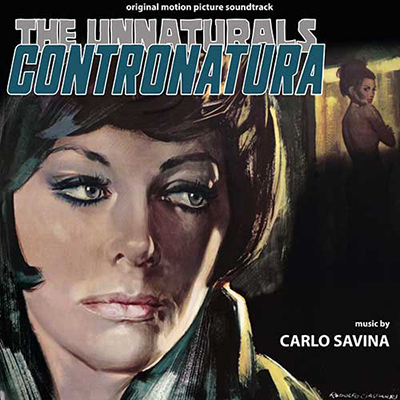 Carlo Savina's score for Contronatura is the 426th Soundtrack of the Week. About half of this score is dance music, a lot of it old timey jazz with banjo, that kind of thing. 1920s style? The first cue sequence for the dramatic score is reminiscent of some of Elmer Bernstein's and Hugo Montenegro's moody, sweeping and jazz-tinged work. The second sequence has that going on as well but also recalls Paul Misraki's music for Alphaville and has an opening that's hauntingly modern sounding. Most of the score is like that, creating textural and suspenseful atmospheres, subtly using harpsichord and vibes while letting strings and reeds play off each other.